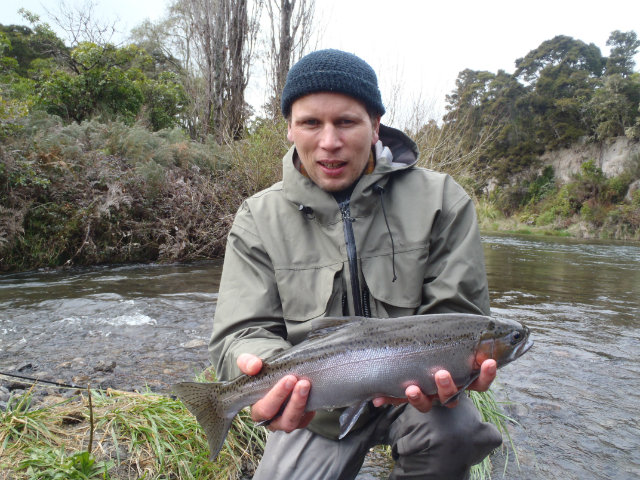 Taupo winter fishing continues to be very productive for most especially with the right conditions for trout to be running in . All week we have had solid cloud cover with drizzle and rain periods topped of with lots of strong westerlyish wind which has kept fish pushing into most rivers. To be honest the weather has been perfect for trout fishing as we have had just enough of this bad stuff without flooding the rivers though I expect the wind may have sorted out a few novice fisherman. 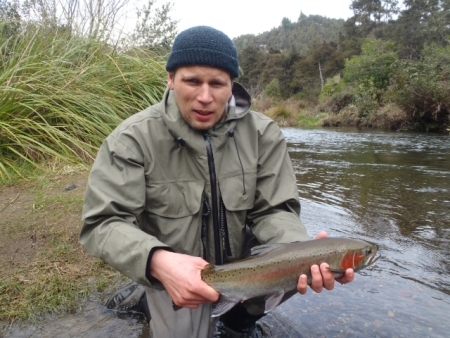 The outstanding river this week must have been the Waitahanui which consistently had good numbers of fish pushing through the mouth with the strong wind. I am not sure if many got past the bridge as they were certainly getting pulled out at quite a rate from the Groin pool and the Bridge pool by many locals. On Wednesday a report came in from a local angler which sat and watched 70 fish come out of the Groin alone this is no doubt a result of late spawning and the perfect wind for trout to run in. IÂ hear that some anglers may have been a little gready or could’nt count to three and go home but that’s nothing new.Â I’m sure there must have been a good run which made it past the lines while running at night and I feel sure they would be scattered through out most of the river by now or even very high in the river getting ready to do their thing. Interestingly their are still good numbers of Browns in the upper section of this river especially around the Limit, Black Fish and Flick and Switch pools. I have only been out once this past week with client Simon James from Auckland and we had a fantastic day on the Hine starting at the water supply and working our way back down below the bridge by the afternoon. Â It will be safe to say that Simon is once again hooked and the faith has been restored in the Taupo fishery after we hooked 20 fish and landed 13 which three went to the smoker and back to Auckland via courier. There are a lot of fisherman like Simon who have lost interest in the fishery as we went through those hard couple of yearsÂ but a trip or two this year timed correctly with the perfect weather and right guide certainly has people talking again and finding the time to get up for a weekend. Simon despite not fishing for the past couple of years was an outstanding angler and I was able to move fast and cover alot of water to find where the best fish were with him. The first few pools produced the odd spent fish or coloured up jack not the sort of fish which would impress Simon so we kept on the move slowly finding better and better fish the lower in the river we fished. There was quite alot of vehicles up river by lunch time and most pools had or were being fished by hopeful anglers so after lunch we decided to shoot down river and see if anything had come in overnight with the rain. I don’t know why I didn’t start down low at the start, I suppose I just wanted the skunking of my back and knew I could get rid of that quickly further up stream. With slightly high water conditions and just a touch of colour the lower river looked perfect to use the glo bug, the fly of choice for those fresh runners which have just entered the river system. The first pool convinced Simon that the fishery was saved as he gracefully pulled 5 hard fighting solid bricks of silver from one run. I must admit they were bloody good fish and I had a big smile on my face watching this guys eyes light up as he screamed “I’m on again” this is the bit of guiding that gets myÂ adrenalin going-love it! !Â We fished the afternoon away hooking and loosing many more fish from just above or below the bridge all on a “flame” glo bug that I had roughly tied the night before. Thanks Simon for making the effort to come up and see what the fishery is like these days andÂ I feel sure we will be seeing you again as soon as you can get away! The Tongariro again has not been rock solid but those who are in the right place at the right time seem to do OK. Where is the right place and right time I hear you say?? I’m not exactly sure to be honest with you as my success and failure is as mixed as other anglers on this waterÂ but if you keep moving and changing up your rig and fly you will be sure to find them eventually. Fishing mid week away from the crowds really has helped me this season and I would expect that means its a case of running those flies through the lie first! I have not used the traditional glo bug in here this season but have gone for more small naturals on thinner flurocarbon. If I opened my fly box at the moment you would not see too much especially after the four days with Phil Norman and his mates but usually I would have Quasimodo nymphs, Green Caddis , White Caddis and Red Copper Johns stacked up in a size #14. I always carry a good amount of differently weighted bombs or front flies and some small split shot as it is vital that these flies are reaching the zone of the trout. 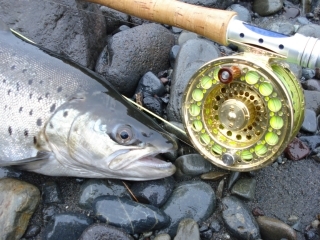 If nymphing is not your thing or the wind is blowing the milk out of your tea wet lining can be very enjoyable and for some the best method to get those bigger angry fish.Â I love wet lining and what better river to use this ancient method on than the mighty Tongariro. The Tongariro offers endless options for wet liners and with the higher flows and long deep pools you can really work that Orange Rabbit or Woolly Bugger successfully. I will be out office and away for a week or so on a different fishing trip through out Thailand so this will be last post until I return back. I hope my next report will show some Mekong Catfish or Alligator Gar or anything weird and wonderful which tugs on the line.Â I will be on line most nightsÂ so any great pics, questions, bookingsÂ or tales of the one that got away gratefully received.